The Sound of Fairy Tales in Ancient Orient. A collection of sounds from forgotten places of the middle east. Create your own melodies with 28 (!) fully playable instruments, deep sampled, with true legato and glissandi, different dynamics and lots of articulations. Once again, Eduardo Tarilonte seduces you into almost forgotten sounding worlds. This time, he moves to capture the sounds of the birthplace of magic and mystic of some of the oldest civilizations. Experience arcane sounds such as being heard in Arabian Nights, the soundtrack of desert sand trickling away in time and music that makes the Prince of Persia dance. 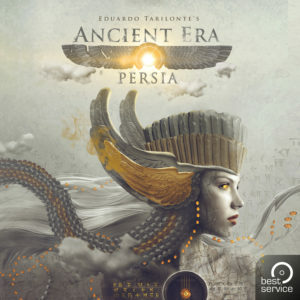 Following his works of Forest Kingdom, Desert Winds, Epic World and ERA Medieval Legends, Eduardo Tarilonte has dedicated this library to the sound of the ancient orient: Ancient ERA Persia. Ancient ERA Persia was created over a period of two years and comes as an extensive library with popular and less known instruments from the Middle East inspiring your fantasy by its touching sounds. Therefore, this library is the best possible choice for movie soundtracks and television documentaries of this region. At the same time, the library is suited for traditional music productions and also provides a perfect background for games taking place in the Middle East. For Ancient ERA Persia, Eduardo Tarilonte has recorded 28 percussion-, wind- and stringed-instruments in highest quality and finest detail. In addition, you will find authentically performed phrases as well as inspiring sound atmospheres. The instruments offer all articulations being used in the phrases. Several microtunings allow the use of every desired tuning for the instruments. Just for the percussions, there are 1.000 loops in different tempos and rhythms beside the playable instruments. 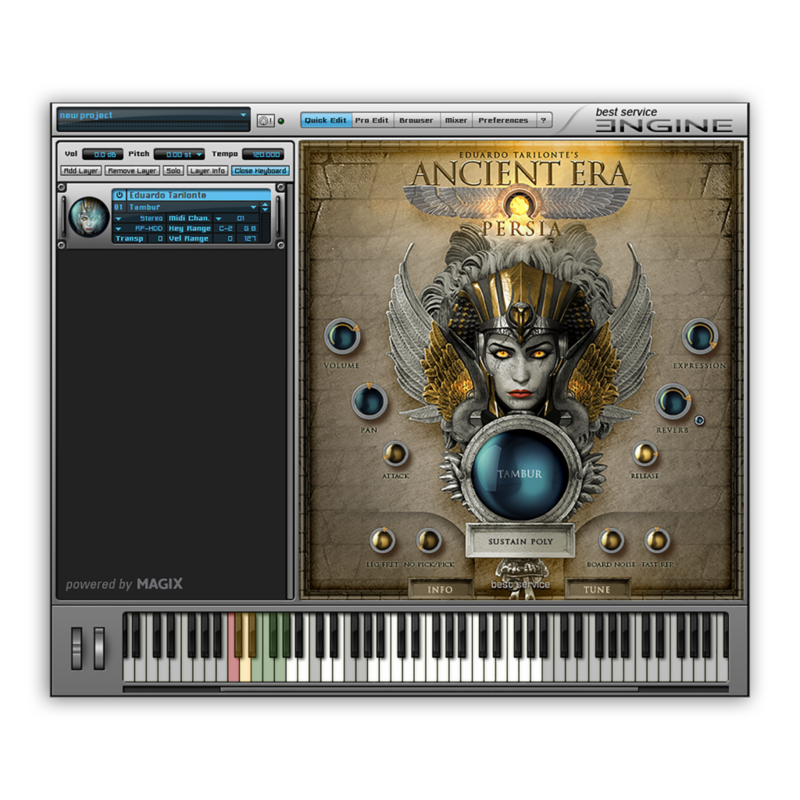 Ancient ERA Persia brings the sounds and musical atmosphere of the Middle East, as it sounded in former times, into the modern DAW-supported production environment. The carefully programmed user-interface of the Engine player allows easy and fast work with this library in a way that musicians can be inspired by the sounds and fully unfold their creativity. Ancient ERA Persia is suited for different applications and genres. The spectrum covers scoring for antique compositions with authentic timbres, fantasy-games, movie soundtracks and new age songs. The sounds of Ancient ERA Persia are really unique and cannot be found in any other library. The excellent choice of instruments, articulations and sound atmospheres provides the musician and producer with an extensive compendium with as good as no sound missing. The instruments of this 17 gigabytes spanning library consist of extensive multisamples (24 bit, 44.1kHz) with several dynamic layers, multiple articulations, round-robins as well as real legato- and glissando-samples. Ancient ERA Persia was recorded at Eldana Studios in Dueñas, Spain by Jorge Calderón and Eduardo Tarilonte. All instruments have been played by virtuosos of the subject including Efrén López, Michalis Kouloumis, Stellios Petrakis, Jerome Salomon and Iván Karlón. For the recording of the instruments, selected Kahayan U47- and Neumann U87-microphones were used with API-preamplifiers and Kahayan Epsilon summing amplifiers. In this library, the instruments were being captured intentionally close without significant room ambience, giving the user full control of the following sound-design and effect selection. This is why the sounds of Ancient ERA Persia may easily be combined with other libraries of Eduardo Tarilonte.